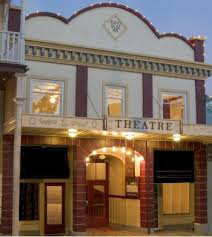 The Sutter Creek Theatre is located at 44 Main Street (which is old State Route 49) in downtown Sutter Creek on the east side of the street, across from the Sutter Hotel, one block north of the city hall and auditorium. Take Latrobe Road from Hwy 50 south to Hwy 16. Turn left onto Hwy 16. Continue to the junction with State Route 49. Go right, (south) on Hwy 49 towards Jackson. Continue through Drytown and then take the left turn for Amador City. Continue until you reach Sutter Creek (about 6 miles from Hwy 16). The theatre is located at 44 Main Street on the left, across the street from the Sutter Hotel. See our map for parking options. Take the Jackson Hwy (State Route 16). We usually pick up from Bradshaw Road or Sunrise Blvd., you can exit to either of those from Hwy 50. Go towards Jackson, east through Rancho Murieta to the junction with State Route 49. Once you reach the junction with Hwy 49, turn right (south) on State Route 49, going to Jackson, and continue through Drytown. Past Drytown take the left turn to Amador City/Sutter Creek and continue until you reach Sutter Creek (about 6 miles from Hwy 16). 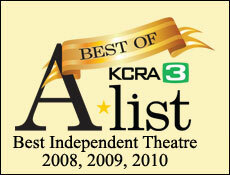 The theatre is located on 44 Main Street on the left, across the street from the Sutter Hotel. See our map for parking options. Several routes going east such as Elk Grove Blvd, Bond Rd, Sheldon Rd, or Calvine Rd will take you to Grantline Rd. Turn left (north) on Grantline. Continue until the junction with the Jackson Hwy, (State Route 16). Turn right (east), towards Rancho Murrieta and Jackson. Continue through Rancho Murrieta to the junction with State Route 49. Turn right (south) on State Route 49, going to Jackson, and continue through Drytown. Past Drytown take the left turn to Amador City/Sutter Creek and continue until you reach Sutter Creek (about 6 miles from Hwy 16). The theatre is located on 44 Main Street on the left, across the street from the Sutter Hotel. See our map for parking options. Take State Route 88 east through Lockeford and Clements towards Jackson. Look for the stop light with a left turn lane for Sutter Creek. Go left, continue to the next stop light (there are 2 gas stations and a Walgreens on the corners). Turn left, go on block to the next stop light, turn right and continue into Sutter Creek. The theatre will be on the right at 44 Main Stree, across the street from the Sutter Hotel. See our map for parking options. Take State Route 89 south to the junction with State Route 88. Turn right (west) on State Route 88, and continue over the Carson Pass until you reach Jackson. In downtown Jackson, turn right (north) at the junction with State Route 49 and continue towards Sutter Creek. Turn right at the 4th stop light, and continue down into Sutter Creek. The theatre will be on the right at 44 Main Stree, across the street from the Sutter Hotel. See our map for parking options. Parking is usually available on Main Street, on side streets to the east of Main Street, and in parking lots near the Post Office on Gopher Street.